Ce document au format PDF 1.4 a été généré par Writer / LibreOffice 5.2, et a été envoyé sur fichier-pdf.fr le 31/03/2017 à 12:31, depuis l'adresse IP 93.93.x.x. La présente page de téléchargement du fichier a été vue 259 fois. Taille du document: 213 Ko (16 pages). 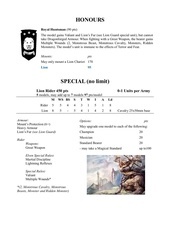 In Iron City army any Characters can be upgraded to be the Battle Standard Bearer (BSB). the table gain Hatred special rule, must always pursue/overrun whenever possible and adds +1 to their pursuit distances. All friendly units (except General) suffer -1 Ld for the remainder of the game. normal Characteristics increases associated with being a Champion. Regiment of Renow and take all Command Group. The Standard Bearer may only take a Magical Standard up to 50 pts. Each Regiment of Renow is max 1 unit per army and counts both towards Dogs of War category. Characters can never join units counts as Dogs of War category. Traits are One per Army. Enslave Drake (see Character Mounts catégorie). - Cannot be taken by models with Towering Presence. Score of any combat they are involved in. may redeploy D3 units of your army. augment to maximum 40% . and Shooting Weapon has he want. Magical Standard without any cost limitations. The Wielder gains Fight in Extra Rank (2) when using this weapon. Attacks made with a Pike gain Armour Piercing (1). Monster Engaged to the front. Shooting weapon. Range 12”, Strength 4, Quick to Fire, Accurate. 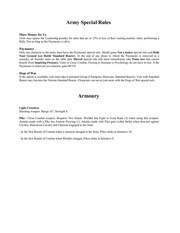 Armour Piercing (6) and Crush Attack speciale rule. - Models on foot only. have Armour piercing (2) and Lightning Reflexes. Strike and ignores the effects of Multiple Wounds. However, his Initiative is reduce to 1. Type: None (6+ Armour Save). The wearer gains Distracting speciale rule. The bearer’s model gains Fireborn and Hard Target. Dispel Attempt in each Magic Phase. The bearer's unit gains Immune to Psychology. 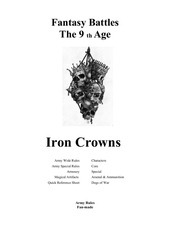 Iron King: The bearer's unit Innate Defence (6+). Tests and discard the highest roll. Lightning Reflexes, Hatred (Dread Elves, Sylvan Elves, Highborn Elves). Sneaky Blade: The bearer's unit gain Armour Piercing (+1). Assassin may perform Make Way moves even when they are in base contact with an enemy model. while the combined model count towards Characters. base to 60x100mm and lose the (2) War Beast. *This unit counts both towards Core and Arsenal &amp; Ammunition Category. This unit is counted both towards Core and Arsenal &amp; Ammunition. and gain Hard Target special rule. *This unit counts both towards Core and Arsenal &amp; Ammunition Category and cannot become Regiment of Renom. Strength 3. Quick to Fire. *This unit is counted both towards Special and Arsenal &amp; Ammunition. also attacked in the flank or rear. (6+), Skirmish and Fly (8). *This unit is counted both towards Dog of War Category and Arsenal &amp; Ammunition. never lose Frenzy special rule. This unit is counted both towards Dog of War Category and Arsenal &amp; Ammunition. 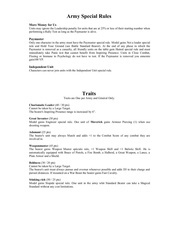 *This unit is counted both towards Menagerie &amp; Curiosities and Dog of War Category. 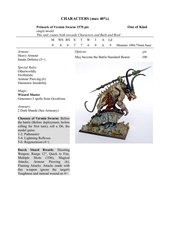 Swing: The Gargant makes 2D6 normal Close Combat attacks against the chosen unit. Initiative Test. If the test is failed, the model suffers 2D6 wounds with Armour Piercing (6). Close Combat attacks. After rolling on this chart, the Gargant may still Stomp as normal. Magic: Wizard Conclave: Evocation of Souls, Spectral Blades (Evocation). Raised with the Evocation of Souls (Evocation). hit. This attack has Armour Piercing (6), Multiple Wounds (D3). Ce fichier a été mis en ligne par un utilisateur du site. Identifiant unique du document: 00500547.